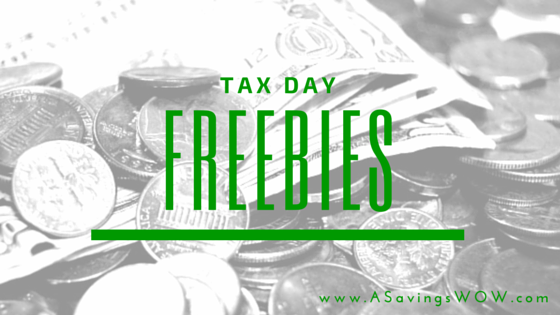 Tax Day Freebies | A Savings WOW! Whether you are happy it’s tax day because you are getting a refund or sad because you have to pay, we all deserve some freebies today. Check out this list of freebies valid during tax day today! Baskin Robbins – buy one ice cream scoop or swirl and get a second one of equal or lesser value for FREE with this printable coupon. Some restrictions (waffle cones) apply, now through 4/27. Beef O’ Brady’s: Take 15% off your bill, 4/15 only. Bonefish Grill: take$10 off any dinner purchase now through 4/20. Burger King – Buy-one-get-one free Whoppers with this coupon from RetailMeNot, now through 4/19. California Tortilla – Get free queso and chips with a purchase when you utter the password “Taxes Shmaxes” at checkout. 4/15 only. Kona Ice: Look for Kona Ice trucks handing out free shaved ices and Hawaiian leis while parked at post offices, tax preparation centers and other businesses, 4/15 only. IHOP: Kids under 12 eat Free for the whole month of April, between 4:00 pm and 10:00 pm. Maggie Moos Ice Cream – get a free sample of Ice Cream Pizza for 3 -7 PM at participating locations. McDonald’s: Big Macs and Quarter Pounders are buy one, get one for just $0.01 at select McDonald’s locations, 4/15 only. Olive Garden: Claim a coupon good for $6 off a dinner for two here, now thorough 4/19. Orange Leaf Frozen Yogurt: Get a full cup of fro-yo with toppings for $4.15. Claim the offer on their Facebook page starting on 4/14. Offer valid 4/15. Outback Steakhouse: Take 15% off your dinner with this coupon from Coupon Sherpa, now through 5/3. Panera Bread FREE coffee- MyPanera members can score one FREE cup of hot or iced coffee per day every day during the month of April. Present your MyPanera card to redeem your reward for a free freshly brewed coffee. Limit one free coffee per day. Cannot be redeemed for espresso beverages. Now through 4/30. Sclotzskys Deli – participating Schlotzsky’s restaurants nationwide will give away one free small The Original®sandwich with the purchase of a 32 oz. drink and a bag of chips, 4/15 only. Sonic – 1/2 price Cheeseburgers all day, 4/15 only. Thanks to More with Less Today for compiling this list of freebies!